BREEAM Communities is a way to improve, measure and certify the social, environmental and economic sustainability of the plans for large-scale developments by integrating sustainable design into the masterplanning process. There is a range of benefits for developers, local authorities and other masterplanning professionals from using BREEAM Communities. It significantly improves the process of stakeholder engagement on large developments, smoothing out the planning process and reducing associated costs. It also provides a credible and transparent means of measuring and defining sustainability at the neighbourhood scale, differentiating the site and demonstrating alignment with National Planning Policy Framework policies. This document further highlights the benefits of BREEAM Communities, including feedback from numerous stakeholders who have had experience of using the scheme. Using site-wide design approaches or technical solutions that result in economies of scale. For example energy technologies, drainage systems, materials, etc. Internationally, BREEAM Communities gives developers and local authorities a clear framework to demonstrate sustainability of a development proposal. Both parties know what to expect and can easily measure the sustainability outcomes and successes of the development. The scheme will aid pre-application discussions, bringing them to the forefront in the early stages of the project, thus improving efficiency and reducing the likelihood of the need to rework of designs. 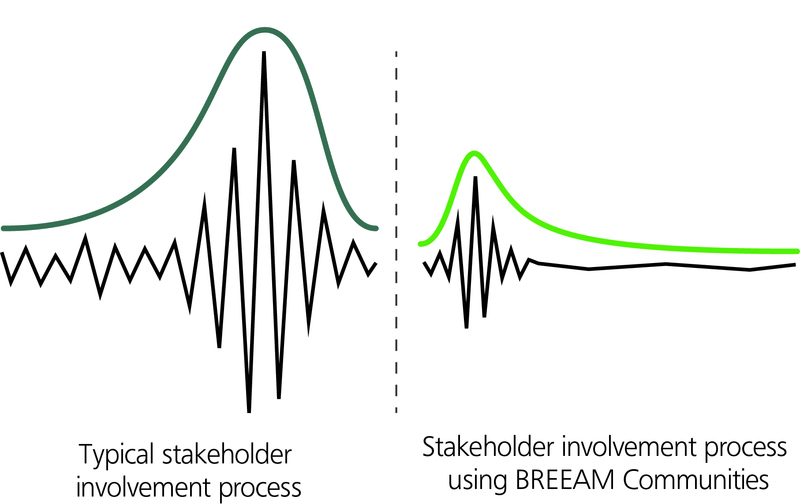 In the UK BREEAM Communities helps to demonstrate that a development proposal satisfies local policies and the National Planning Policy Framework. This is particularly useful in the case of the ‘presumption in favour of sustainable development’. Higher ratings for building level assessments as a result of realising additional sustainability opportunities at this earlier stage and on a wider scale. Feedback to date suggests that BREEAM Communities reduces the amount of work involved in the masterplanning process. It is a framework to facilitate good planning, with most of the mandatory requirements being studies that developers are already required to complete for projects of a significant size, for example, an Environmental Impact Assessment. The scheme ensures these studies are undertaken at the right time, bringing together and making use of the evidence from these studies to identify what can be done with the unique issues and opportunities on the site. BREEAM Communities is being used both within the UK and internationally. This map demonstrates the international uptake of the BREEAM Communities scheme. To date 19 projects have been certified under BREEAM Communities with a further 37 currently registered and undergoing assessment, with the size of development ranging from 2 ha to 179ha (as of the publication date). There are currently 94 licensed assessors in 15 countries across the world.